Opera is one of the most unique outcomes of the Western classical music tradition. It is the unique combination of narrative, theater, music and the human voice set in an extravagant manner. Producing one can be a financially crippling matter but for the devoted fans of opera, there is nothing quite like the aesthetic and emotional experience associated with it. Today, modern opera has developed into a much-loved art form. With operas such as Song from the Uproar in 2009-12 and Rasputin in 2001-03, the modern take on this form of music has the ability to fill up large audience halls. If you want to catch some of the best operas in 2018, you need to get your hands on these opera tickets at the earliest. Opera today is as respected and loved as it was in 16th-century Florence. Let’s take a look at the rise and reinvention of this genre over the past four centuries. Origins in the 16th Century: The first ever real opera can be associated to a group of intellectuals in Florence called the Camerata. This group recreated the original form of Greek drama, and one of them then composed the famous Dafne in 1597. Baroque Period (1600-1750): After the successful experimentation of the Camerata, follow-up performances soon started taking place in Italian courts for the entertainment of guests. Opera’s first masterpiece, L’Orfeo by Monteverdi was created during this period. Opera then started to spread all over Italy and Greek myths continued to provide subject matter to the art form. The public form of opera began to take shape in 1637, when the first opera house was opened in Venice. Classical Period (1750-1800): Along with serious opera (opera seria), this period saw noted developments in the world of comedy opera (opera buffa). Towards the end of the 18th century, Mozart also drew on these traditions in a series of comedies – Nozze di Figaro in 1786, Don Giovanni in 1787 and Cosi fan Tutte in 1790. Mozart also renewed the interest in opera seria with works such as Idomeneo in 1781 and La Clemenza di Tito in 1791. Romantic Period (1800-1890): This period saw the effects of the French Revolution on opera. New themes and subjects made their way to the works of several famous artists such as the Paris-based Italian Luigi Cherubini, someone whose work was greatly admired by Beethoven. Bel canto, the beautiful singing style started to become more common, as can be seen in the works of Rossino, Bellini and Donizetti. National traditions began to take shape everywhere, each with its own unique identity. Glinka, Tchaikovsky and Mussorgsky from Russia concentrated more on history or fairy tales; Dvor? ák, Smetana and Janá c? ek from the Czechs concentrated more on comedy, realism and fairytale and the French preferred the historical epics of Meyerbeer. Verismo (1890-1920): Towards the end of the 19th century, there was a renewal in Italian opera under the battle-cry of verismo. A realistic approach was adopted towards the treatment of subject matter. This tradition was most aptly represented by Puccini, who produced various works such as La Boeheme, Madama Butterfly and Tosca. The age of the contemporary opera started with the arrival of John Adam’s Nixon, in China in 1987. It is what marked the emergence of the so-called CNN opera, which was largely based on recent historical events. The Death of Klinghoffer in 1991 and Doctor Atomic in 2005 are some of the finest examples of the developments in modern-day opera. Pop composers also took an interest in this form of music as they explored the relation between drama and music. References to opera can be found in the works of prolific artists such as Pascal Dusapin, Hans Werner Henze, Wolfgang Rihm, Judith Weir and Mark-Anthony Turnage. Andrea Bocelli: The Italian singer, songwriter and producer will be performing some of his most legendary operatic works at the Teatro Del Silenzio in Lajatico, Italy, on the 28th of July, 2018. Metropolitan Opera: The Merry Widow: The famous operetta by composer Franz Lehar is coming to your town on 30th of December, 2017, in New York. 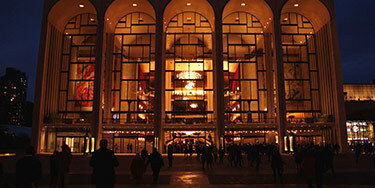 Celebrate this New Year with the most wonderful music ever at the Metropolitan Opera at Lincoln Center. Joffrey Ballet: A Midsummer Night’s Dream: With music from Benjamin Britten and a storyline from the great William Shakespeare himself, A Midsummer Night’s Dream is an opera not to be missed. It will be taking place at the Auditorium Theater in Illinois on 27th April, 2018. Tosca: An opera by Giacomo Puccini, in three parts, Tosca first premiered in Rome in 1900. It contains themes of torture, suicide and murder, along with some of Puccini’s best-known lyrical work. The opera is all set to come to Detroit at the Detroit Opera House on 7th April, 2018. Yale Opera: The Magic Flute: The famous opera by none other than Wolfgang Amadeus Mozart is one of the finest works of this genre. To catch it live in its most modern form, you need to head to New Haven on February 16th 2018 and watch as the magic unfolds at the Shubert Theater. Opera house tickets for the latest shows are now available at the best prices. If you want to get a good deal on these, you need to continually update yourself on the latest shows taking place around you. In addition to the shows above, you can also get your hands on tickets for Rigoletto, taking place at the Muriel Kauffman Theater in Kansas City, the Pensacola Opera: Madama Butterfly at the Saenger Theater in Florida and Rigoletto at the Duke Energy Center for Performing Arts in Raleigh in North Carolina.